Whew! I Now Know Why Atlanta Is Called Hotlanta!! Thursday, July 26 – I had the joy of traveling out of Newark to Atlanta. In the summer, whether you’re flying in or out of Newark, expect delays. On this day, the weather was fantastic! However, the crew for our flight was stuck in Cincinnati because of weather issues there. Two hours later we were finally on our way. Patience is required when flying in the summer, that’s for sure!! Maybe it’s my now thin blood from living in the northeast (NJ) for two years, but it was sooo hot in Atlanta. The car temp said it was 102 and the news said the heat index was 111. That’s crazy, and evidently, this is how it’s been all summer long!! Luckily, the only times I had to be outside were in walking to/from the car, hotel, train, restaurant, and office. So, my air conditioning got a workout, that’s for sure. 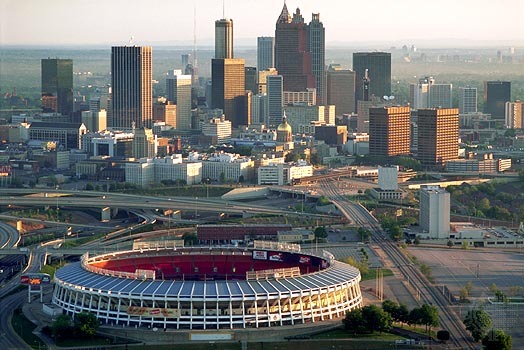 Living in Charlotte and Raleigh, NC, I’ve had opportunities to visit Atlanta many times in the past. In college, it was to attend the Peach Bowl on New Years (NC State v. Mississippi State – we won! ), few times for work, once to give a presentation at the Project Management Institute (PMI) North American Congress meeting, and another time for a job interview (which I turned the offer down out of college). I thoroughly enjoy Atlanta!! Car Rental Return at the airport has to be the nicest one I’ve seen before. I think this was built when the Olympics was held?